Vacation rental condominium. 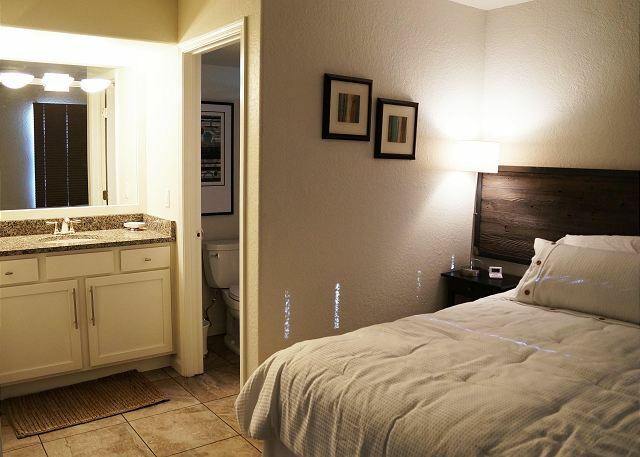 Sleeps 6, 3 bedrooms, 2 bathrooms. Dogs allowed. 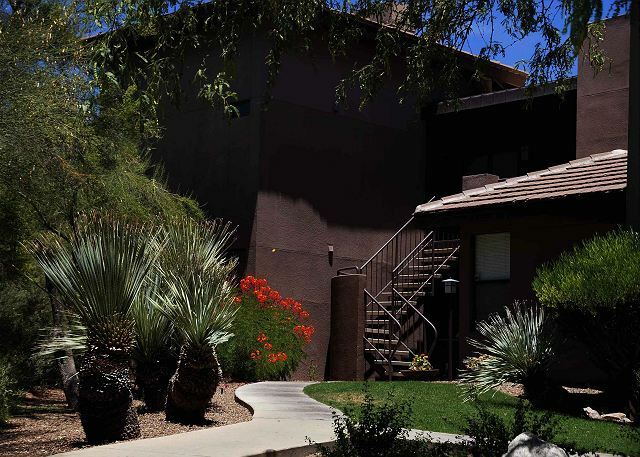 This spacious 3-bedroom, 2 bath is on the 1st floor and has a private extended patio and backs up to the desert and Tucson Mountains! Kitchen is upgraded with white appliances, king bed in the master, twins in second and queen in third/office. 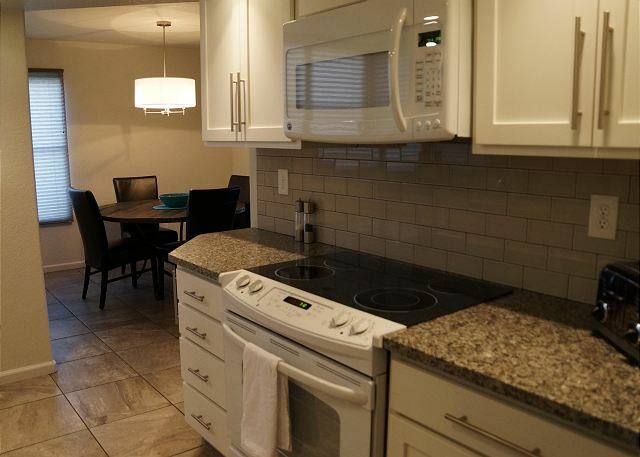 Condo is well equipped and has many personal touches including bath robes! 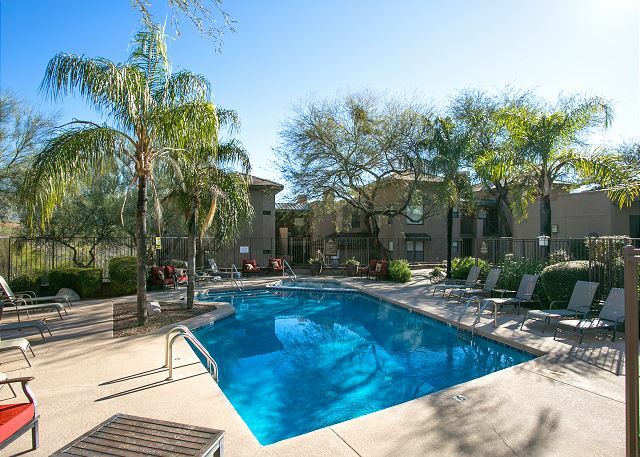 Located close to the assigned covered parking with only 6 steps from the parking lot, this condo is also close to the East side heated pool, Jacuzzi, community grill and clubhouse. 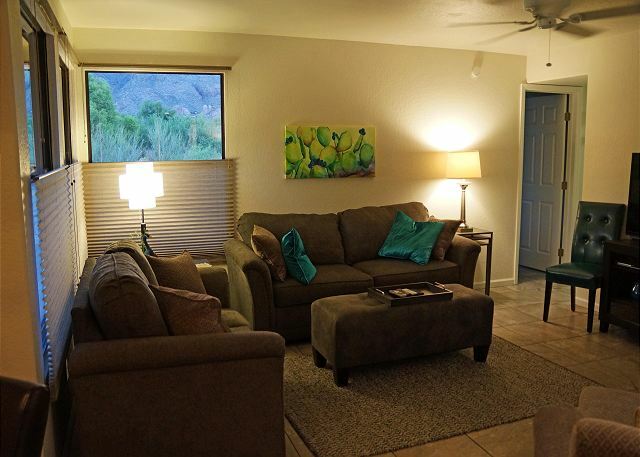 Walking distance to the grocery store, many restaurants and only minutes from Sabino Canyon! Whether here for a week or a month this is the perfect rental. Overall the experience was good. The condo was clean, and it had most of the necessary items. We had a couple of minor issues including not having trash bags and the we had some electrical issues with the breaker tripping. Both issues were fixed. We would recommend the condo for renting. More than I expected from the pictures! Gorgeous place! This property is absolutely beautiful. 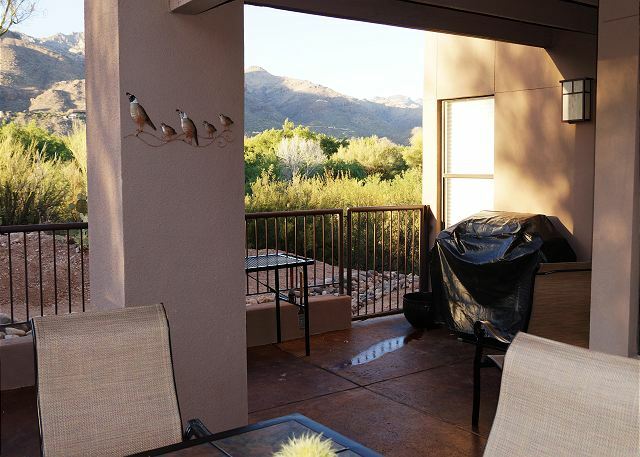 The views are breathtaking with amazing wildlife right outside your backdoor. The location of this property is very private and secluded. If you like to cook, the kitchen is loaded with everything you need from appliances to dinnerware. 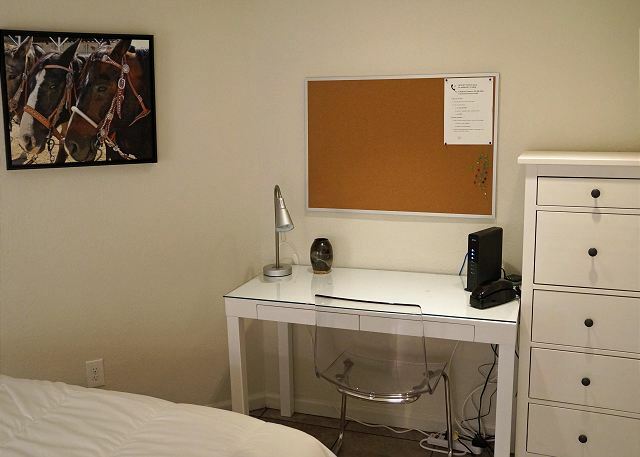 This property was very clean and well maintained. The property management was very kind and accessible when needed. I would definitely stay here again! Our ninth year at The Greens. All was perfect, as usual. Wonderful unit. Jeanine took care of us as always. Have a reservation for next year. We had a great time in Tuscon and enjoyed our rental very much. Clean, well-maintained. Lovely view from the terrace. Nice little pool and hot tub available in the complex. Our only comments would be that #1: the unit is only about 100 feet from a road that is well-traveled at some times of day. Traffic noise a problem for us sometimes. #2: The grill is electric and (we now know) takes a lot longer to cook things. Generally a lot of fun. 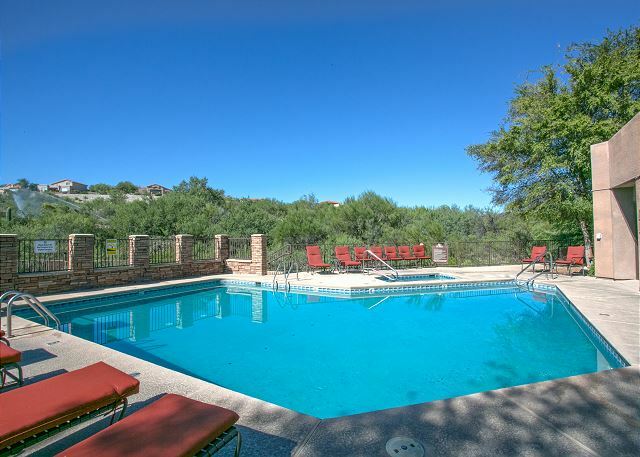 The Condo was in a nice and secluded area of Tucson, but had the amenities one would need within walking distance. It is in the building closest to Kolb, so you hear some of the traffic during the busier times of the day. The condo itself was awesome. Everything was up to date and clean. The kitchen was fully stocked with all of the cooking utensils you would need. The patio offered amazing views of the mountains and the sunsets AZ is so famous for. The only downfall was the fact that I was on an overnight shift while staying there and for the last 3 weeks I was there the apartment upstairs was getting renovated. The construction made it extremely difficult to get good sleep. Once this was brought to Jeanine's attention she did everything she could to make sure the rest of my stay was nothing short of amazing. Every morning (when weather permitted -- we had a cold front go through w/ rain) I'd sit out on the patio with my morning coffee and enjoy the Canyon. It felt like being next to a jungle, with all the bird calls and wildlife walking by! This ground-floor unit was perfect for my elderly parents and we all really enjoyed it. Beautiful condo and exactly as pictured in the ad. Everything appeared to be brand-new and furnishings/dishes, etc. were high quality. We loved it! Close to pool/hot tub which were very warm and lovely and we pretty much had them to ourselves due to the time of year. We would definitely come back and stay again. View from patio was gorgeous. 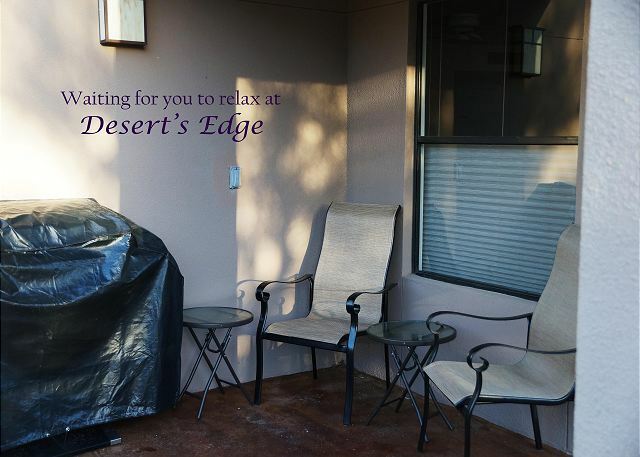 Our overall experience was Positive and Pleasant.The first floor unit with the desert and mountain views was perfect. We had a terrific time. 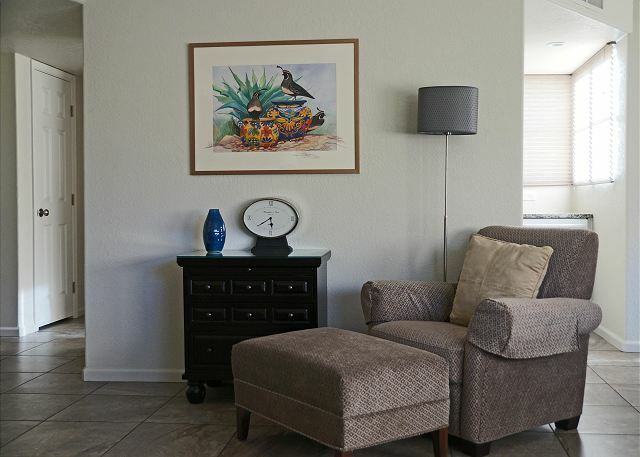 We love our condo---it's perfect for us---and we love the community events as well. We love the staff, the other guests, just about everything--can't wait for next March!!! We had an excellent two-week stay! 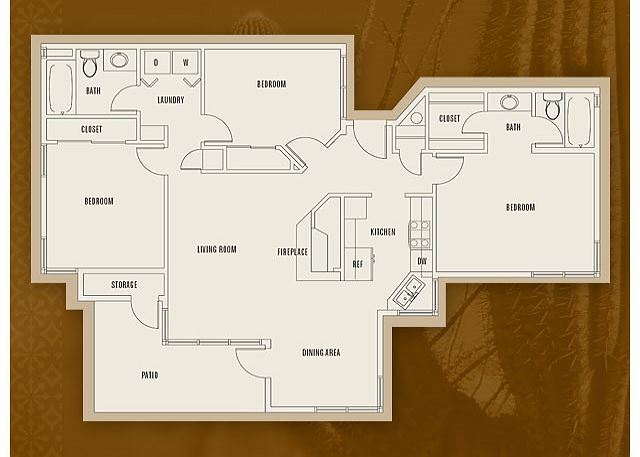 This condominium is nicely laid out and fully equipped! A great location in beautiful part of the world. We rented this unit to house my son and his family for a week. We were in building 13 and this perfectly was located next door. The unit was perfect for a family of five and they loved it. I want to give special recognition to Jeanine Bradley and her staff for working this out for us. She is an outstanding representive of your company and a pleasure to work with. In part because of her, we have signed up for another month next year. After hunting around for a place that we want to return to each year we come to Tucson we think we have found it. We'll see you next March. 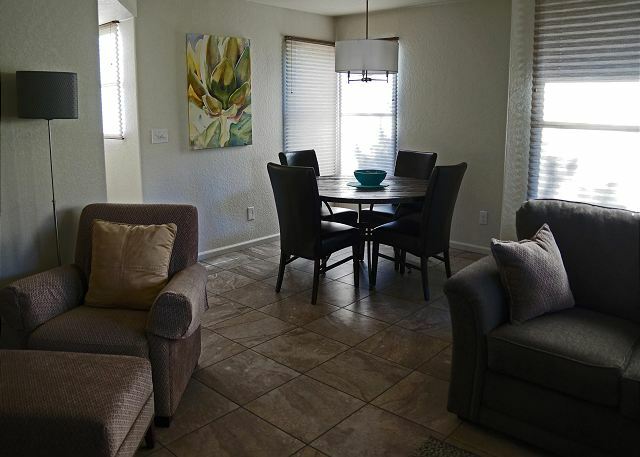 Enjoyed the roominess, the enclosed patio for our small dog to enjoy being outdoors but yet contained, the closeness to shopping and restaurants, and the free wireless internet. Easy checkin and checkout. Great overall experience! 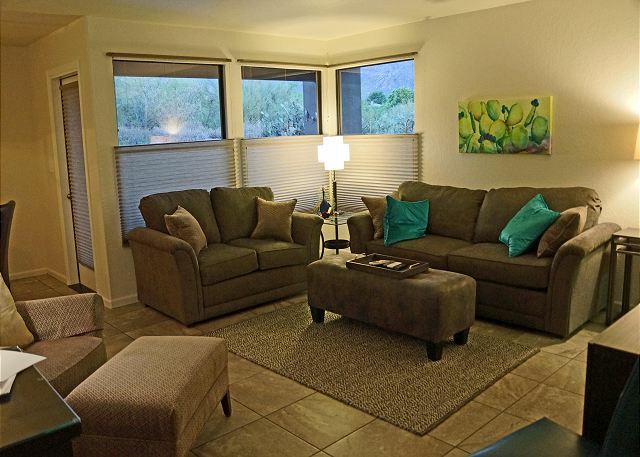 We were very happy that we chose this unit for our stay in Tucson (4 adults and 1 toddler). We visited for 5 days in late Oct and the heated pool in the complex was great. 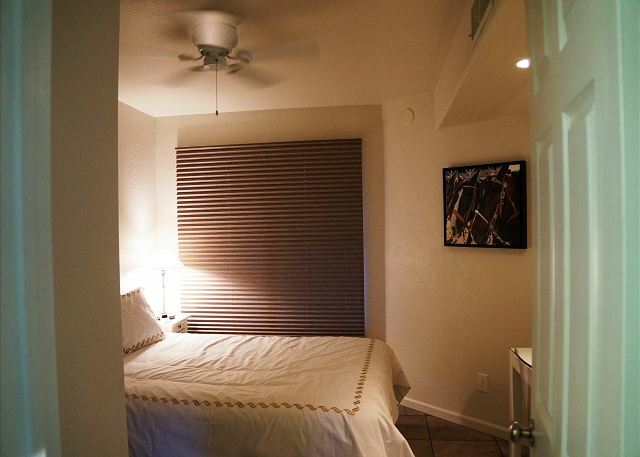 I was impressed with the quality of the unit- the furnishings were new and good quality (including very plush towels). The patio was a decent size and had beautiful mountain views.